We went to see this the other Saturday. In my last film review I noted that when we go to the cinema most of the other movie-goers tend to be getting on a bit. Possibly due to our film choices these days. Well, for this one it was my good wife, me, another (older) couple, and that was it. Like a private screening. Don't know what the other random couple thought they were doing, gatecrashing our exclusive viewing. Cheek of it. 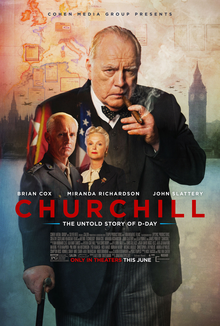 Churchill, the film. Historically speaking almost a case of 'never in the field of cinema have so many facts been sacrificed for so little dramatic effect'. The central conceit was that our eponymous hero was dead against D-Day, haunted as he was by the epic failure of the Gallipoli campaign during WWI. Admittedly, it had been a while since I read Churchill by Roy Jenkins, but as the film unfolded, that didn't seem quite right. It wasn't. Churchill may have had some reservations concerning Operation Overlord, but to depict him calling upon the heavens to thwart the allied landings was pushing it a bit. A lot. Some have called the film a 'hatchet job', but that's not quite fair. Churchill comes good in the end and delivers his rousing D-Day speech to the nation. Just like the ones he used to give during the Blitz. And they thought he was past it. Brian Cox gives a towering performance as the war leader. In turns melancholy, meddlesome, ill-tempered and yet ever the Great Man. Miranda Richardson is almost as imperious as his Clemmie. Verdict: a triumph of acting over plot, but still worth a look. At least you'll have plenty of elbow room in the cinema.